It's my birthday today and I am so thrilled. My gorgeous family have all given me money so that I can buy lots of the Tim Holtz dies, so they are on order and I can't wait for them to arrive so I can have a play with them. Yesterday I was blog hopping and found a new challenge site called The Shabby Tea Room. 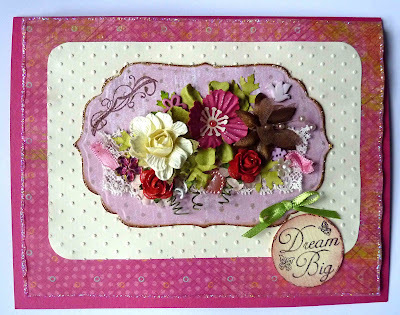 It's their first challenge this week called 'Elegant Shabby' with a gorgeous photo as inspiration for the cololurs of pink, red, cream, brown and green. I couldn't resist and set about creating straight away and just loved working with this palette. What do you think? I used a nestability label die to cut out the centre shape and cut it from a thin chipboard and cut and embossed the paper to stick over the top. The flowers were put over a piece of cream lace with pink ribbon threaded through it and I punched, died and scrunched the leaves. These were all put together with a few embellishments and with some Stickles and Sakura glitter pens. The background is the embossing folder I won on the Simon Says Stamp blog hop a few weeks ago and the backing paper is K&Co. So dream big and live your dreams today. I am off to get ready to go out with some friends for a meal. See you again soon and thanks for dropping by. This card is lovely. 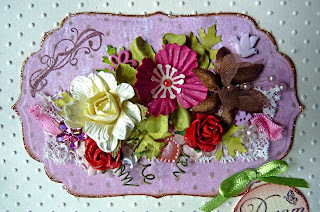 I love the way you have used the lace and ribbon to back the beautiful array of flowers,they look almost real. What a pretty card! I really love all the flowers in the center and the touches of glitter around the edging. I'm such a sucker for all things girly like this! Thanks so much for playing along with us over at The Shabby Tea Room.